Our exclusive collage painting of a hippo jumping over the moon will delight all who see it, even non-hippo lovers! 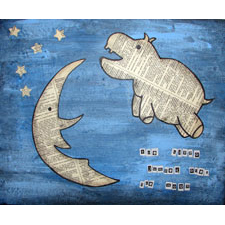 Painted on a 12" x 10" stretched canvas, the hippo and the moon are cut from old French dictionary paper and applied to a distressed painted background. This will look charming in any room of your home that needs a little whimsy! These are hand-made and no two are exactly the same.